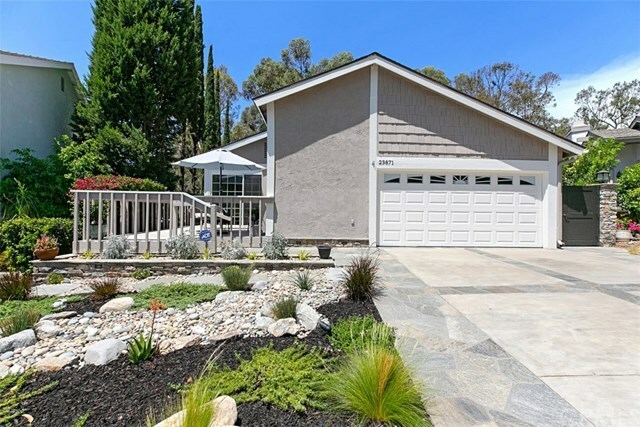 Located near the end of a quiet cul-de-sac in the desirable Timberline community- you will fall in love the minute you walk through the doors of this completely remodeled and highly upgraded home. The style is sleek and contemporary and yet there is a very comfortable warm feeling throughout. The photos say it all. The kitchen has new white cabinetry, white and grey marble counters, stainless appliances and a breakfast nook. Other recent upgrades include wood laminate flooring, dual paned doors and windows throughout, recessed lighting, and a spectacular master bath with custom tiled shower and marble counters. This unique split level floorplan is perfect for entertaining - there is formal living room and dining room with soaring cathedral ceilings, as well as a large family room off the kitchen. There is a private master suite on the upper level while the 3 secondary bedrooms are on the lower level. There is a beautiful and peaceful natural greenbelt view from the 3 outside decks as well as a patio with paver tiles in the backyard. This home shows a true pride of ownership and has been meticulously maintained. You won't be disappointed. The Timberline community has association pools, volleyball court, and playgrounds.